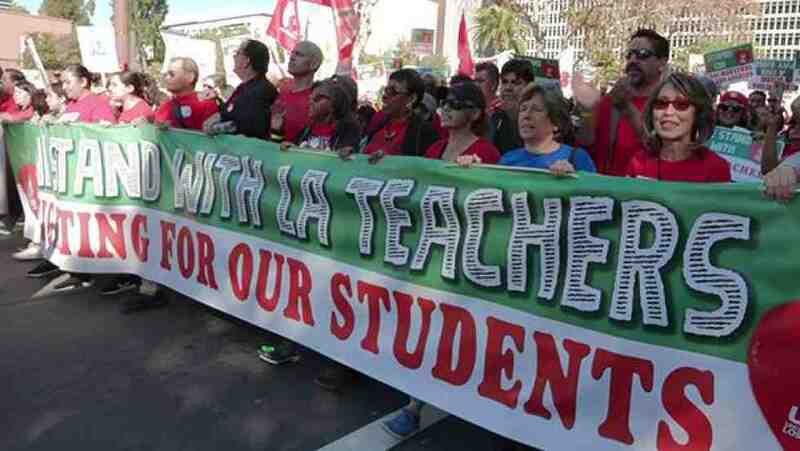 United Teachers Los Angeles has been negotiating for nearly two years. Of course, members want the school district to pay them fairly, but most of their demands are about strengthening their schools(link is external): smaller class sizes(link is external); less testing; and more art, music, counselors, nurses and librarians. At its heart, this strike—like those last year in West Virginia, Oklahoma, Arizona(link is external) and elsewhere—is about confronting years of disinvestment and scarcity in education, and prioritizing public education as an opportunity agent for all children. That’s why thousands of parents and students(link is external) have joined educators on rain-drenched picket lines in Los Angeles and have filled “strike backpacks” for teachers with snacks, water and supportive notes from students. A recent poll found that 82 percent of Los Angeles County residents support(link is external) the strike. The seeds of the austerity plaguing the state’s public schools go back four decades to Proposition 13(link is external), a property tax revolt largely responsible for California—the world’s fifth-largest economy—plummeting to 43rd(link is external) in the nation for per-pupil spending. In Los Angeles, austerity has been made much worse by the efforts of a group of wealthy individuals and foundations to move half the students in the city into charter schools(link is external), which drain nearly $600 million from neighborhood schools(link is external) every year. The group spent nearly $10 million in 2017 to elect a pro-privatization majority on the school board, who then rammed through the appointment of Superintendent Austin Beutner, an investment banker with no education experience. But this is not a debate over charter versus public schools; it’s about ensuring that all public schools have the conditions they need for student success. In fact, AFT members at a Los Angeles charter school chain also went on strike this week, calling for improvements(link is external) in teaching and learning conditions. We hear a lot about “choice” in education. Failure to invest in children and their schools is a choice. Beutner holds the purse strings to a nearly $2 billion surplus(link is external), yet he is claiming the district is broke. He chose to force a strike rather than address the legitimate problems that teachers—with parents’ and students’ support—have raised. To shake essential resources loose, educators are finding they have no choice but to use vehicles like strikes, walkouts and demonstrations. Trump has shrugged off the effects of the shutdown(link is external), but he is causing countless Americans to cut back on lifesaving medicines, rely on food pantries, miss mortgage payments, and endure overwhelming stress and uncertainty. My union is offering interest-free loans(link is external) for furloughed members; one recipient immediately rushed to pay his past-due rent with his loan. And among the many groups trying to help federal workers stay afloat, one charity has set up a food bank for FBI agents working without pay.